A crying baby disrupts your sleep, making it impossible to get everything you need to get done throughout the day. If you’ve experienced a wailing infant in the dead of the night, you know exactly how challenging it can be to function normally in the morning. Learning your baby’s sleep habits early on allows you to adjust immediately, so you both benefit from the changes. 1. Use a white noise machine to drown out disturbing sounds. This works well for adults, too, who can’t fall asleep easily due to the slightest disturbances. 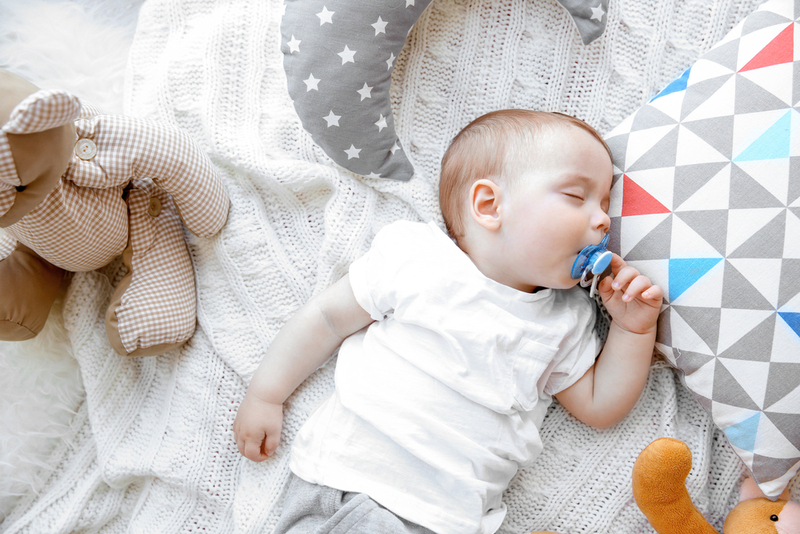 With the Lovey’s Artificial Intelligence Baby Monitor, infants wear bands on their bodies that alert parents to sleep interruptions. The Lovey’s Parents wristband beeps when you don’t respond to the app by clearing failure spots relayed to you by the monitor. You can use the white noise machine to drown out sounds without interfering with your ability to help your child if he or she needs assistance thanks to the bands that you both wear. 2. Soothe the child for a few minutes but then leave the room. It may take them some time to get used to the new routine, but most infants adapt quickly. Knowing that you’re nearby is enough to settle an uneasy baby. They’ll fall asleep shortly after seeing you and eventually stop crying out in the middle of the night out of fear. That means more sleep and less stress for the two of you. 3. Stop night feedings. When your pediatrician says it is okay to stop breastfeeding or bottle feeding in the night, wean your child slowly by reducing the number of feedings by one. They’ll eventually learn that crying won’t get them an extra meal. They will then choose to sleep so they can wake up to their next feeding. 4. Tend to your older child first. If your baby has a tendency of waking up your toddler, take care of the older of the two. They’ll have an easier time falling back asleep because they’ve already established a routine. While the baby is waiting for you to assist them, they’ll have already started soothing themselves. You’ll have less work to do to get them to fall back asleep. The suggestions listed here are very effective solutions to help your child fall asleep and stay asleep throughout the night. When your baby is adapting to a new sleep schedule, it’s important that you remain firm but patient. It may feel like torture letting him or her cry for a little while, but you’ll soon find that by allowing them to do so, they’re learning how to communicate more effectively. Now that you know how to get your baby to sleep peacefully through the night, you’ll benefit from the extra rest you receive, too. Following the advice listed above makes it easy for you to enjoy restful slumber more frequently. You’ll be able to get more done the following day because of how well you slept the night before.